This book reviews the general theory of strategy, relates it to the particular circumstances of the construction industry, and shows how it can be applied in practice. It brings together ideas from economics, marketing, management, business and politics to develop strategic management for both contractors' firms and the associated professions. Substantial changes have occurred in the industry since the book was first published in 1991. This Second Edition reflects the major developments that have followed the Latham and Egan reports, and includes new chapters on international strategy and marketing, showing how they can contribute to the strategic planning of construction organizations. The book will provide a valuable tool for the strategic development of construction firms. Dave Langford is the Director of the Graduate School in the Department of Architecture & Building Science at Shrathclyde University in Glasgow. He has contributed to the field of construction management for over 25 years and has lectured and consulted throughout the world. He has written many academic papers and several books including two which he co-authored for Blackwell, Strategic Management in Construction and Construction Management in Practice. Introduction PART A - Construction and its Business Environment. Construction - an Overview of the Market. The Strategic Role of the Actors in the Construction Process. PART B - Concepts of Strategic Management. The Firm and the Strategic Management Process. Strategic Behaviour of Construction Firms. PART C - Techniques for the Strategic Planner. Portfolio Management, Delphi Techniques and Scenarios. Marketing and Promotional Strategies in Construction. 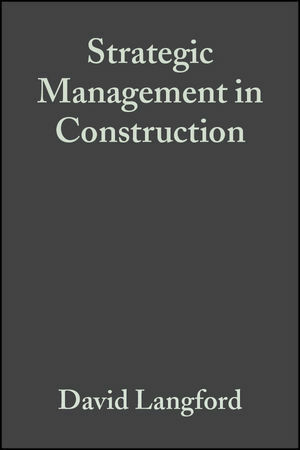 A synthesis of Strategic Management in Construction. * Strategic management increasingly important after the industry's major problems of recession in the early 90s.